Adjustable from less than 1 pound to over 3 ½ pounds overall trigger pull weight. The first and second stages are independently adjustable for weight and feel. 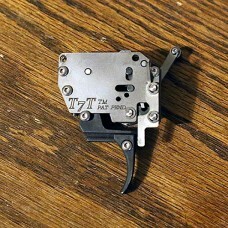 The T7T is a true two-stage design which lets the user tune the trigger’s feel for desired break weight while maintaining generous, safe sear engagement up until the moment of firing. The sears in this trigger will properly reset when trigger is partially engaged.